The two Lib Dems popped out for a pint to sort things out. Unfortunately half the press were locked out. Nick Clegg and Vince Cable decided to settle their differences over a morning pint, to trumpet the Liberal Democrat victory in fighting for greater protections for pub landlords. It was a bit odd. To start with, it was a press event but only a couple of journalists were allowed in. 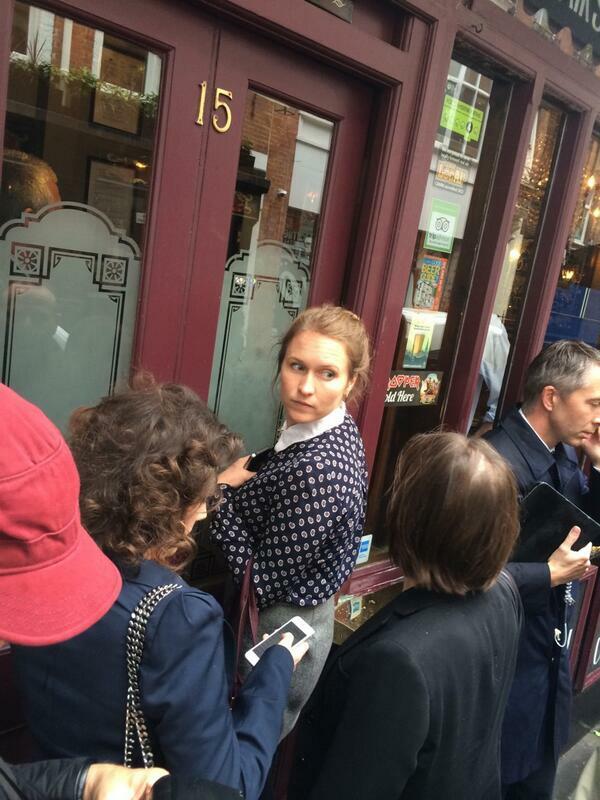 And if there's something a journalist hates, it's being locked outside a pub. This one was the Queen's Head near Piccadilly Circus, where a not-exactly-beefy Lib Dem adviser was acting as bouncer for the day. Due to open by 11 a.m. the pub was instead kept closed for the personal enjoyment of the Deputy Prime Minister, keeping the hardworking families of Alarm Clock Britain from their morning pint and potentially affecting the nation's #LongTermEconomicPlan. Instead the British press were reduced to sticking their noses up against the window to try and get sight of the men who were inside for a press event. Passers-by kept asking who was inside, hoping for a Kardashian. Cable, the business secretary, has spent the last week busy distancing himself from his former ally Lord Oakeshott who appeared to attempt a half-hearted coup against Nick Clegg last week. That's a Lib Dem coup that could have benefitted Vince Cable quite a lot, launched by Vince Cable's ally. As a result we are able to bring you this photo. Nick Clegg pulled a pint of London Pride and then handed it to his Lib Dem colleague/friend/potential leadership challenger. Cable supped carefully. Very carefully. Probably because London Pride is a pretty awful pint. Sky News resorted to running a live video feed of a pub window. Anyway, time to have some sympathy with Nick. We've all had that moment where the bloke in the pub just won't shut up and there's twenty journalists pressed up against the window being snarky outside. And you just go: well, what's this all about? I mean, really? The pupil premium, all those policy papers and this is it? Suddenly Clegg and Cable vanish into the pub interior. The journalists are outside. It's still raining. And we've lost the news. Vince Cable's advisers turn up separately but the guestlist is so tight that even they can't get in at first. Inevitably, because the internet's like that, people on Twitter are now making jokes about potential Lib Dem pub names. Then a man arrived with crate of basic supplies, sparking further rumours that Clegg and Cable are holing up inside for the foreseeable future. These builders walked around to have a look. One rudely declared "Nick Clegg, he's not even on the map any more" while another did a half-hearted UKIP chant. A builder working on a property opposite also mooned out of the window at this point. We'll mark them down as "floating voters". All of this was going on while the theatre next door pumped out the works out of Frankie Valli and the Four Seasons, from the "PHENOMENAL" Jersey Boys musical. Suddenly a rumour spreads that the Deputy Prime Minister and Business Secretary are about to be bundled out of a secret back entrance, so everyone legs it to the next street over. We're giving up hope. But eventually Clegg and Cable – both armed with rictus grins – escape from the depths of the Queen's Head and head off to run the country after a morning pint. More politicians with that attitude, please. Then, just yards from where a giant Octopus had blocked the road an hour before, the event spills over onto Regent's Street as Clegg and Cable search for the last BMW out of central London. Giant Nick Clegg media scrum blocks Piccadilly Circus. And that, ladies and gentlemen, is how you launch a Liberal Democrat policy that will enable pub landlords to go to a tribunal if they feel they're getting a tough time from large companies who are glorified property developers charging unfair rents and forcing individual tenants to buy all beer and supplies at above-market rates, therefore undermining the community cohesion of the Great British Pub. Not that we got to ask either of the politicians about that.